Since I've started this blog, I've covered quite a few of Taiwan's old streets with plans to visit more as they are often a wonderful look back into Taiwan's storied history. The old street I'm introducing today is probably my favourite of all the old streets and despite some recent changes which I think takes away from the authenticity of the old street, I still go back several times where the vendors and shop owners recognize me and in some cases even know me by name! Neiwan Old Street (內灣老街) is in south-eastern Hsinchu county’s Hengshan township (橫山) and next to Jianshi (尖石鄉) the beautiful Atayal area known for its mountains and rivers. The village is quite remote and is part of the reason I like it so much. 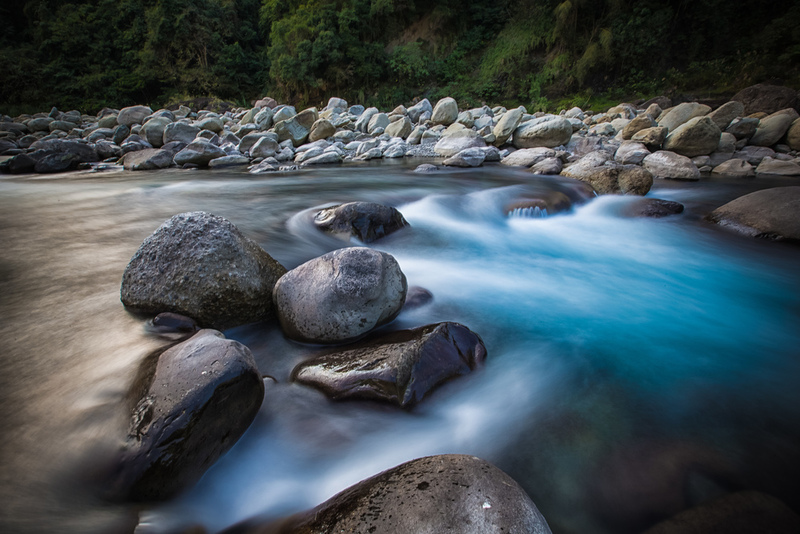 It is nestled in the mountains next to a beautiful river and is quiet for at least five days of the week. 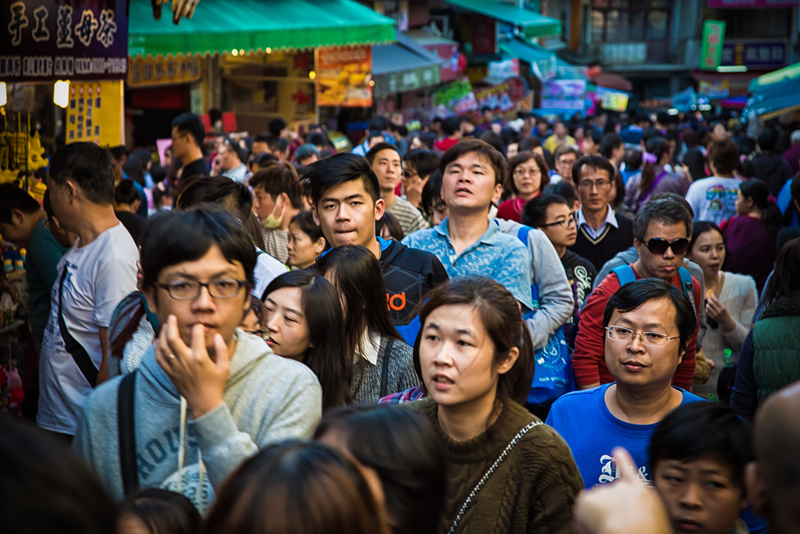 On weekends the old street comes alive and is jam packed with tourists sampling many of the treats the street is famous for as well as the Hakka culture that is so prevalent in the area. The origins of the town are quite similar to what we have seen with my previous posts in Daxi and Sanxia where historically the town was set up as a way-point in the logging and mining industry. This brought a lot of prosperity and opportunity to the people of the bustling little village which quickly became a self-sustaining town with banks, post offices and movie theatres. When the mine closed in the 1960s the town slowly transformed into a backwater and it fell out of public consciousness almost until the turn of the century when the it started to be marketed as a popular tourist destination becoming one of Taiwan's “old streets” (老街) and a strategy was devised to keep tourists coming to visit. While most of Taiwan’s old streets are known for the architecture of the houses lining the streets being constructed with “baroque” designs, the Neiwan old street isn't like that at all - The town became prosperous much later than the others and that style had already faded by that time and wasn't very practical in such a remote area. The architectural style of the houses along the street is pretty much the same as what you'd see in many of the older neighbourhoods around Taiwan. So without the "old street" feeling, how has Neiwan become so attractive to tourists? I believe that it is in part because of the Hakka culture and cuisine, the quaintness of the town and also because of the special railway line that brings tourists into the small village making it quite special and differentiating itself from other old streets. The railroad that brings people into Neiwan is a special branch of the Taiwan Railway. It isn't on the main mountain (山線) or ocean line (海線), so if you plan on going to old street via the train you will first have to get to Zhudong Train Station (竹東車站) and then transfer to the special Neiwan Liujia line (內灣六家線). The line was completed in 1951 and departs every 90 minutes from the city. The train (slowly) brings you through the mountains and part of the experience of going to Neiwan is taking the train and enjoying the scenery on the trip. The problem with the train is that it takes a long time and it doesn't come very frequently. If you travel to Neiwan by train on a busy day, you need to make sure to line up quite early to take a train back to Hsinchu, otherwise you may get stuck and it is very likely that you'll have to stand for the entire 90 minute ride. If you do take the train, make sure to check for information about the bus just in case you get stuck in a long line and can't make it back by train! The old street has a number of popular Hakka restaurants and there are also a number of vendors lining up on each side selling local specialties like Hakka sticky rice (客家麻糬), Hakka desserts, tea, and pretty much anything you might expect from a typical night market. 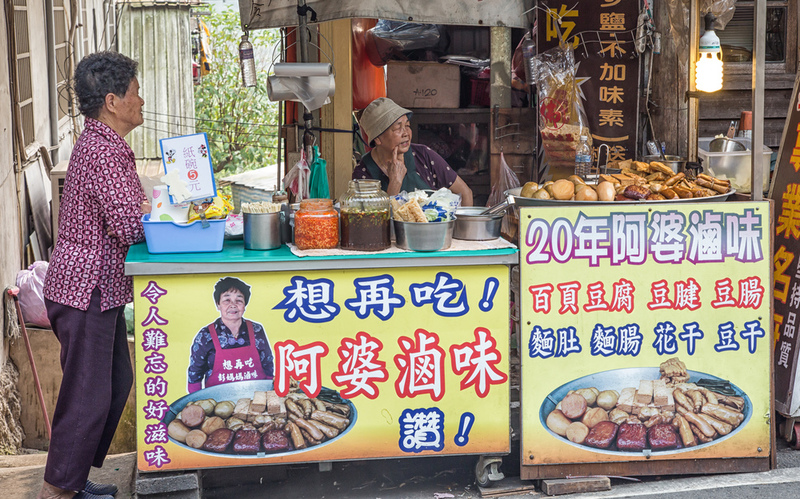 The street is quite well known for one of its Indigenous sausage vendors as well as vendors selling a special type of glutinous rice (野薑花粽子) wrapped in ginger leaves (as opposed to lotus leaves), and of course my favourite, Hakka Lei tea (客家擂茶) which is one of the main reasons I've been back so many times. One of my favourite places to eat is the old Neiwan Cinema (內灣戲院) which is an old style theatre that has since been converted into a popular Hakka restaurant. The restaurant still plays movies and they even have a store where you can buy DVDs of the old Taiwanese movies that they play. I watched a movie in the theatre a few years back while having dinner titled: “The Green, Green Grass of Home” (在那河畔青草青) which was one of director Hou Hsiao-Hsien's (侯孝賢) earliest films about a teacher from Taipei who was assigned to substitute teach at the elementary school in Neiwan and falls in love with the resident teacher there. The movie was filmed on location and it was amazing to see how the village looked decades ago compared to how it looks now as well as well as the dedication to promoting environmental preservation that would become part of Hou's career as a director. When I said earlier that people know who I am in Neiwan, I wasn't joking. I’ve been going to the same Hakka Lei Tea vendor (阿珠擂茶) for years and every time I come back the owner gets really excited and somewhat embarrassingly yells about how long it's been since I've been back. The tea in this place is awesome and you can choose to either make the Lei Cha by yourself (which actually takes a lot of time and hard work grinding the stuff up) or you can have it made by the boss. She sells hot and cold versions as well as a iced smoothie type. If you've never tried this tea, I highly recommend you sit down for a pot and enjoy some of her awesome Hakka sticky rice (客家麻糬) with it. Now that I've said a bunch of nice things about the old street, it's time to do a little bit of complaining - The old street (like a lot of places in Taiwan) has changed a bit in the past few years. It remains a big attraction for Taiwanese visitors but it has become a destination for bus-loads of of Chinese tourists. This isn't necessarily a bad thing, but I feel like the authenticity of the old street has been lost and what was once an “old street” has branched off into several streets selling kitschy things to tourists. I'm not particularly a big fan of the new changes which even include go-kart tracks and noisy carnival-like attractions. I tend to avoid those areas and stick to the more traditional areas of the village. If you haven't been to Neiwan before, I recommend just staying in the original street which starts at a 7-11 and goes past the train station, downhill past the theatre. It's a long straight street and you don't need to really wander off to the side streets which are the new ones full of flag-following tour groups. That being said the new streets that have been incorporated into the old street have brought me to explore other parts of the residential area of the village and I have found quite a few things that even after visiting for the first fifty times. There's a large temple behind the old street and near there is a bridge with a small stream that the train passes over - in the stream is a traditional Hakka set up for doing laundry and on off-days you can still see the residents of the town doing their laundry in the street. The street is also a popular attraction for viewing fire flies and in April and May people come from all over the country to see the fire flies that are native to the area behind the village. If you get a bit tired of wading through crowds on the weekend, I recommend taking a walk across the old Neiwan suspension bridge that connects the village with the other side of the river. You can also go down to the river banks where you will see locals playing in the river and having barbecues. If you traveled by car or scooter I also recommend driving a bit further up the mountains past Neiwan into Jianshi (尖石) where the river is a bit more beautiful and eventually becomes an Indigenous area where you can find some great food, hot springs and really friendly people. I've been going to Neiwan at least four or five times a year for well over ten years. I'm a big fan of this old street and everything it has to offer. 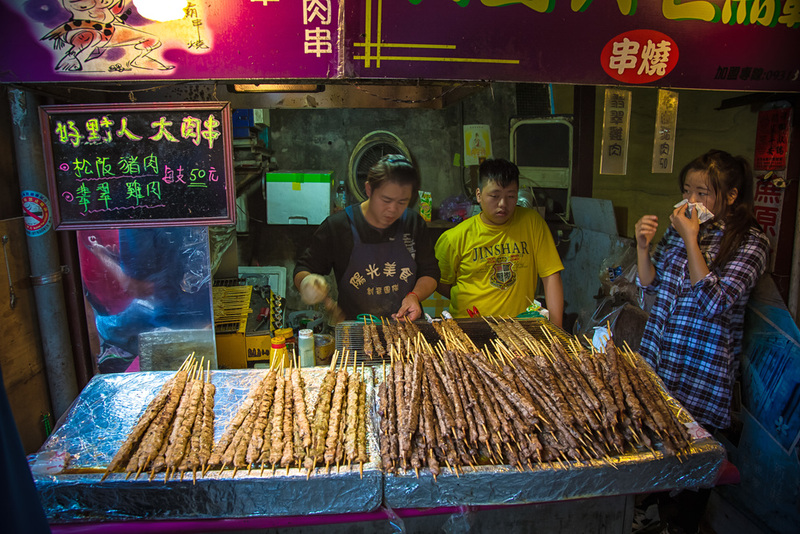 It is in the middle of the mountains, there's a beautiful river, great traditional foods and even some of the more modern snacks that you'll find in many of Taiwan's modern night markets. It's great for a day trip especially if you want to get out of the city for some fresh air and good food. If you have any comments or questions don't be shy – comment below!